Happy St. Patrick’s Day! – Well what an exciting week it has been at The Festival! 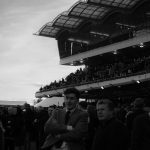 We were lucky enough to get close to the action at Cheltenham this week for the ultimate battle of the English Vs the Irish. 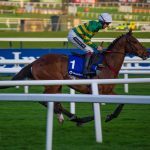 Robbie Power brought home the coveted Gold Cup with Sizing John. A heart stopping, edge of your seat race. It summed up the mood for the whole week as favourites fell and outsiders powered through to the finish. Attendance records for 2017 were once again smashed with Gold Cup Day being a sell-out, long before the big day and another great turnout for a beautifully sunny Ladies Day on Wednesday. But the sun sadly didn’t shine down on favourite Douvan in the Queen Mother Champion Chase, with a shocking win from outsider Special Tiara. We feel a little sorry for the gentleman who placed £400k on Douvan to win! Ouch! Although the good news is Douvan is set to recover pretty quickly from a stress fracture, no doubt we’ll see him back in the Autumn. The atmosphere was electric at this year’s Festival, (even if it was a little nippy). Sir AP McCoy unveiled his new statue on the first day of The Cheltenham Festival with the hilarious reaction “Unfortunately, it looks just like me”, delivered in his usual, dry Irish tone. Even more hilariously, our very own Vicki made headlines quaffing Champagne in the Moet & Chandon tent! She was a little gutted that it was The Daily Star and not The Telegraph but thank goodness she wasn’t skiving off work – that would have been a tough one to wriggle out of! 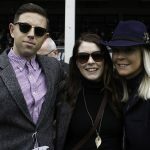 If you weren’t lucky enough to attend this year’s Cheltenham Festival then hopefully you didn’t miss the action on ITV. The channel won the rights to broadcast the racing in a 4 year deal reportedly worth £30million; taking over from Channel 4 who have historically broadcast all the major horse racing fixtures for more than 30 years. ITV said they hoped the change would generate increased revenues for racing. 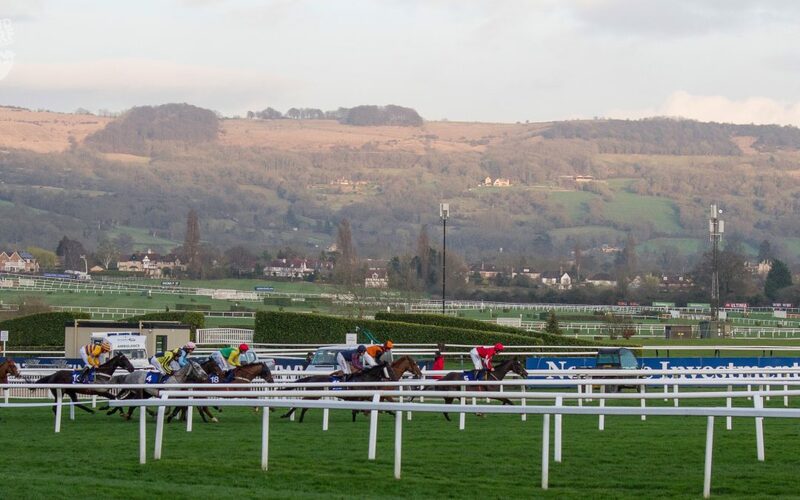 Chief Exec for Racecourse Media Group, Richard Fitzgerald added “The unprecedented level of interest in the tender shows what an attractive proposition the sport is.”. We were certainly impressed with the Festival coverage all week and it meant we didn’t feel we were missing out too much when the office needed us back in! Great to see the very talented Jack Kennedy gaining his first win this year at the age of just 17 and he broke his leg not once but twice last Autumn! Madness! He’s been hotly tipped for great things in the saddle, with more success to date than the great Sir AP McCoy had at the same age. Go Jack! More history was written by Lizzie Kelly, the first female Jockey to ride in the Gold Cup for 33 years. As a student amateur she beat champion AP on New Year’s Day in 2015 and has already broken records by becoming the first female jockey to win a Grade One jump race in the same year on Tea for Two, who she raced this Friday. When interviewed on taking part in the Gold Cup she said “Tea for Two is not a 500-1 outsider – we’re not going for the free lunch.” – she certainly meant business but sadly it wasn’t to be for Lizzie as Tea just didn’t want to play ball and she fell early in the race. Here’s to next year Lizzie! The girls still came out in force though with a BRILLIANT Foxhunters Challenge seeing Bryony Frost and Katie Walsh coming 1st and 2nd respectively. 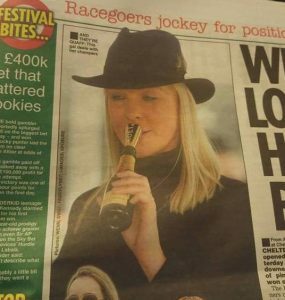 Trainer Paul Nicholls will no doubt be exclusively hiring ladies from now on we reckon!! You whinny some you lose some! We hope you had a few winners and aren’t crying over your bank balance (like our anonymous Douvan backer) but just in case you need cheering up, we thought we’d end with this hilarious video, Garage music commentators – Just Brilliant! See you at The Festival 2018!